Getting around in Ecuador can present any traveler with a challenge, whether it's the traffic, windy mountain roads or scams. Here's how to see Ecuador safely. Ecuador's bus system is notorious for a high level of theft – especially at major bus terminals, such as the Trolébus in Quito. This is similar to elsewhere in South America, where criminals wait for heavily loaded backpackers to arrive. If you stay alert and don't let your bags out of sight, you shouldn't have any problems. Make no mistake, those pesky pickpockets don't just stay at the terminal, it's very likely they'll get on the bus with you. So keep your bags close and your eyes sharp. Avoid putting items on the overhead racks, keep your belongings secure on your lap. Once you're on the bus, hold on for your life. The hasty drivers careen around the Andes ranges like they're in dodgem cars – and good luck if you ask the driver to slow down. Some travelers have reported drivers starting impromptu races with each other – so the chances are you might end up an unwilling participant in an unplanned racing event. Pollution in Ecuador has been described by some travelers as unbearable. Exhaust belches from run-down cars and buses, with a ferocity equal to the volcanoes. 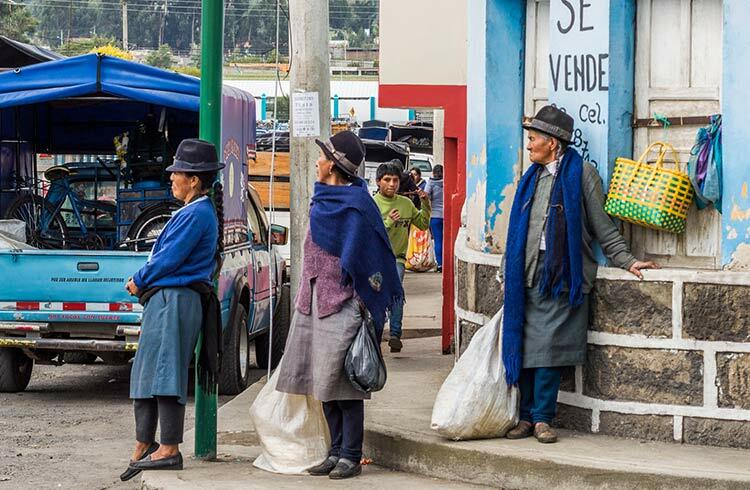 When compared to elsewhere in South America, the bus system in Ecuador is a cheap and relatively reliable system of transportation. Taxis are the more expensive, yet the safest option for travel around Ecuador. Travelers generally say that taxis here are reliable and comfortable, and relatively cheap compared to the fares paid in developing nations such as US or Australia. To make sure your taxi is official, look for yellow cabs with a number painted on the door, and make sure the meter is on – if it isn't, negotiate a reasonable price before you get in and buckle up. At the end of your taxi journey, make sure your driver doesn't try to bump the price higher – avoid this by reinstating the price agreed upon when you got into the taxi. Taxis ordered by your hotel, rather than being hailed on the street, are the most reliable. If you plan to get around using your own set of wheels, car hire is not for the faint of heart. Ecuador's locals are relaxed, drive with a lack of caution and there are frequent accidents on the roads. Keep your headlights on at all times, the locals tend to keep them off, so this is a good way for them to see you than vice versa, and, for this reason, avoid driving at night. Expect cars coming the opposite way to scream around hair-pin turns on busy mountainsides, so go slow when taking corners, as there are no passing lanes. To avoid vehicle theft, commonplace especially outside of major centers, always lock up, and, if you're leaving belongings in the car, put them out of sight. If you're involved in a car accident, you might find that many Ecuadorians run away to avoid the consequences. Even worse for travelers involved in a crash, the situation could turn very ugly if the person at fault is not decided upon fast. Picture a mob of angry people pointing fingers – not the experience' you're after. If you hire a car, some dodgy companies will charge you for damages you have not made to the car when you return it. Take time-stamped photos of the vehicle the moment you pick it up – this will prove you haven't done anything wrong. Tips for a trip to the Galapagos, traveling to high altitudes, vaccinations to get before you go, safety for women, and crimes to watch out for. One of the greatest natural wonders on the planet, the Galapagos is a must see for any traveller to Ecuador. Here's how to enjoy the natural beauty safely. Traveling through Ecuador, Andrés Brenner unexpectedly discovers a fiery New Year’s Eve custom. Safety feature matter every where. Good and informative post it is. Like the first photo of blue sky.